Believe it or not there is still a market for stupidly expensive designer mobile phones. And it doesn’t matter that much if their specs are ever or so out of date as long as they are finished in something shiny. 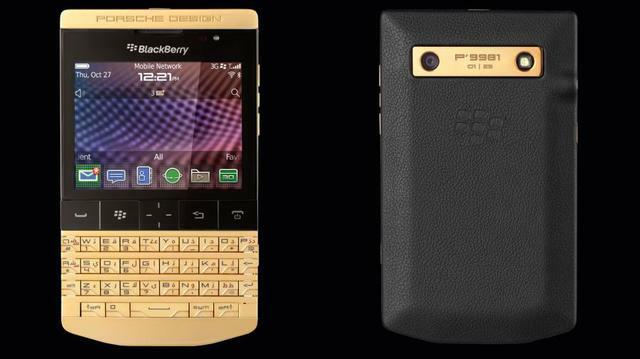 If you love the idea of gold mobi then you then you are sure as hell going to love the Porsche Design P’9981 BlackBerry which was unveiled today. On the downside – it is a bit old school. It runs the BB OX 7.1 platform (not the shiny new BB10 platform the brand’s newer handset runs on) sports a 2.8-inch touchscreen, 1.2GHz processor, 768MB of RAM, 8GB of internal storage and 5MP camera. However what the Z10 doesn’t have is this model’s stainless steel case which has been covered in a layer of titanium before having a 24-carat gold coating applied. Very shiny! If you do fancy one though you’ll have to move quickly as there are only 25 models in existence. You can however buy the non gold-plated version for £1,250.